The entire team at Tribine Harvester, LLC is celebrating as the first all new Tribine’s have left the final assembly area at the factory in Newton, Kansas, USA. Tribine is the first fundamentally new harvester concept since the second world war and is designed to help farmers operate in a more productive and efficient way. Reducing compaction is also a key benefit. Four aligned low ground pressure tyres, with centre articulation and pivoting rear axle, ensures that the Tribine leaves only one trail. Other machines use up to six tyres of varying widths and spacing, creating multiple paths and more compaction of the soil. Speed of harvesting is improved by the ability to unload the 1,000-bushel grain tank in less than 2 minutes and the 500 gallon fuel tank capacity enables 24 hours of continuous operation. 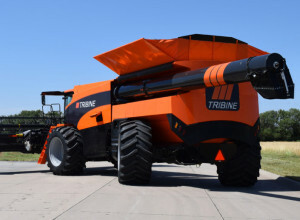 While it is new to the market today, the inventor, farmer, and company President, Ben Dillon has been working on this concept for nearly 20 years, and developed four generations of machines before going into production with the machine that is now known as the Tribine. In January 2015, he assembled a group of engineers, all of whom have experience in designing and manufacturing combines for other OEM’s, establishing Tribine Harvester, LLC in Newton, Kansas. As Dillon admits, “It took me twenty years to get here, perhaps I am just a slow learner”.